Morning loves! I’ve been holding onto this recipe a bit…tweaking until it was just right. Most of the chamomile muffins out there have chunks of chamomile tea in them…which neither my kids nor I liked. At all. And if you try to soften the chamomile before adding it to the batter it will tinge the batter a drab color. Not into it. At the same time I was futzing with this recipe I was working on another one using pink peppercorns. Same problem…nobody wants a big, hard bite of pink peppercorn. The solution? Throw the chamomile + sugar in a high-speed blender and blitz until fine. It gently scents the batter without the unwieldy chunks of chamomile. 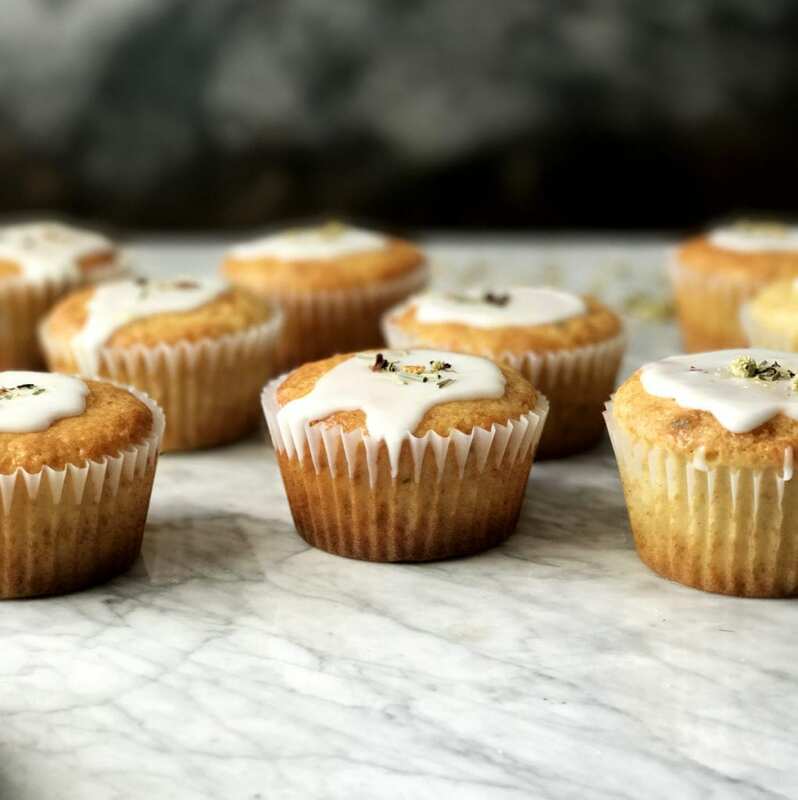 These muffins are perfect for brunch…a quick breakfast…something elegant…or just a breakfast with nice people. Nothing wrong with that. Basically, anytime you want to celebrate citrus. Perhaps paired with a lemon-vodka number? Then you definitely want to call it brunch so you can drink before noon. Make sure your blender is absolutely dry before grinding the sugar + tea or it is an absolute pain in the arse to get out of there. Also, the blender will blitz the granulated sugar into a powdered sugar-like consistency. Don’t fret. You’re doing it right. If you can’t be bothered with Meyer lemons, just sub in regular lemons. NBD. I absolutely love Mighty Leaf Chamomile Citrus Tea…this isn’t sponsored…it’s just my fav and in my house at all times. This is the tea I used for these muffins. For the photos, I decorated the muffins post-glaze with a sprinkle of tea. This looks really cute…but in reality, it doesn’t taste that great…in my humble opinion. When making them for us, I would not use the chamomile on top. If I was serving these for an elegant brunch, I would. Let’s make some muffin magic, shall we? 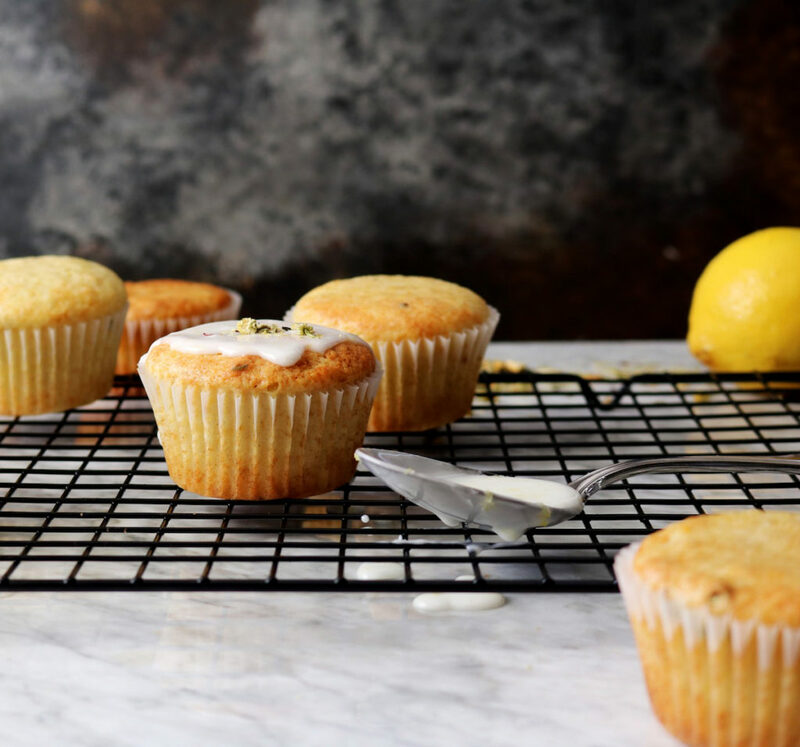 Optional: Squeeze fresh lemon and sprinkle a pinch sugar on the tops of the lemon chamomile muffins prior to baking. It gives an extra pop of lemon flavor + it makes a slightly crunchy crown, which I love. Preheat oven to 375 degrees F. Place a rack in the top third of the oven. Line a muffin tin with muffin liners or spray with nonstick cooking spray. Place the sugar + 2 teaspoons of chamomile tea in a high-speed blender and grind until the chamomile is reduced to small flecks. In a large bowl whisk together your granulated sugar (with the chamomile in it), vegetable oil, eggs, sour cream, milk, lemon juice and zest until well blended. In a medium bowl whisk together the all-purpose flour, baking powder, baking soda, sea salt, cinnamon, cardamom and nutmeg. Add the dry ingredients to the wet ingredients and mix until barely blended. Let cool in the muffin tin for about 10ish minutes, then use a butter knife to help get them out to finish cooling on a rack. While cooling, in a small bowl whisk together powdered sugar, lemon juice and milk. 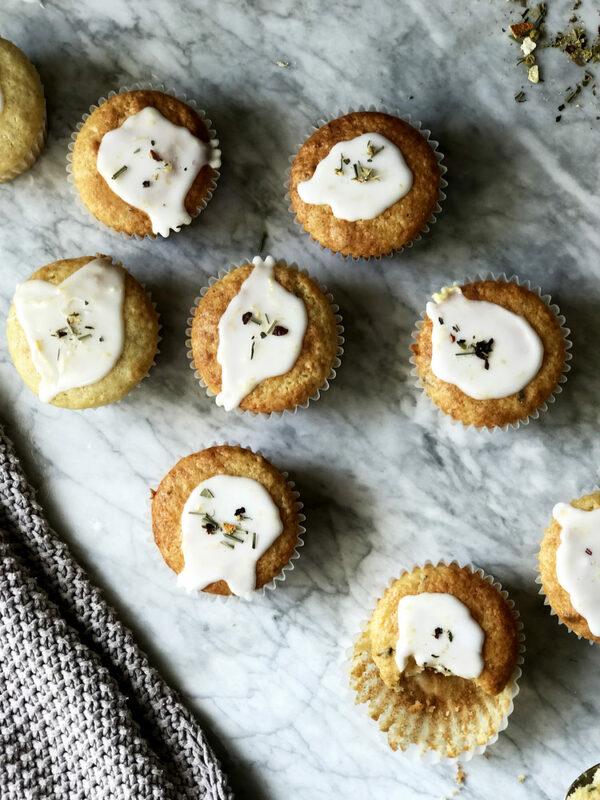 Drizzle glaze over the lemon chamomile muffins. If you’d like, sprinkle chamomile tea over the tops. Note, the tea looks pretty…but I’m not jazzed on biting into the tea bits as noted above. Store airtight at room temperature…they’ll keep for a couple of days. 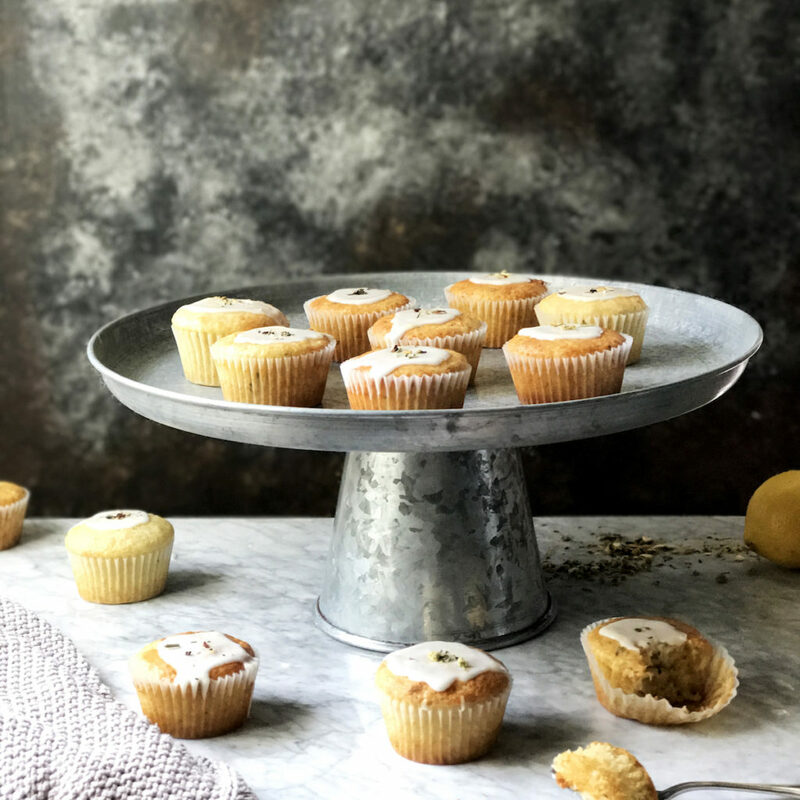 Be sure to tag me @displacedhousewife #displacedhousewife so I can see your lemon chamomile muffins!! It’s hella raining in California and it’s amazing. Lakes are getting full…rivers are running…my skin looks dewy. All is good in the world. 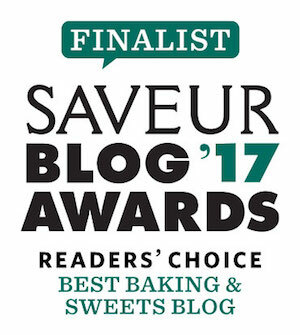 I am SOOOOOOO excited to tell you guys that I worked on a feature for Bake From Scratch magazine. 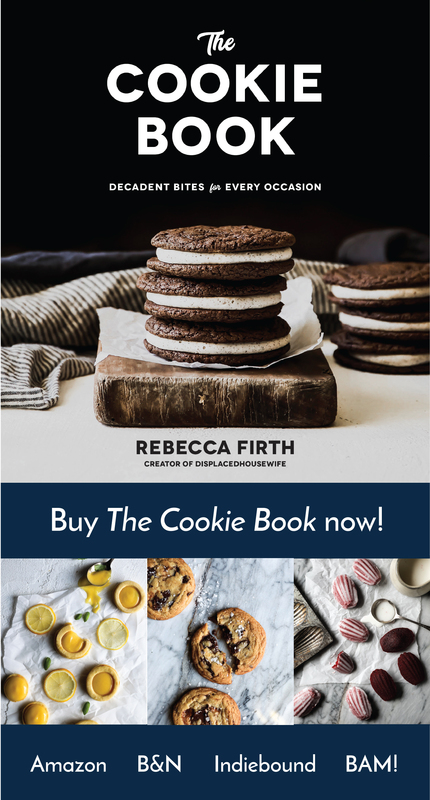 It’s coming out Holiday 2017 and includes six recipes: cakes, loafs, madeleines, cookies and scones. I spent all day in LA this past Thursday with the Bake From Scratch team, an amazing photographer + his assistant and they worked magic. The pictures are GORGEOUS. I wish I could show you all now…but tuck this away for next fall…we have a ton of holiday baking to look forward to! Some top-shots make me dizzy, like I’m falling into the photo. I don’t mind now. Gotta bake this tonight! Looove that you teased out the chamomile issue for us Rebecca! I do not like chunks of peppercorn or tea leaves in my cake/muffins/cookies either! 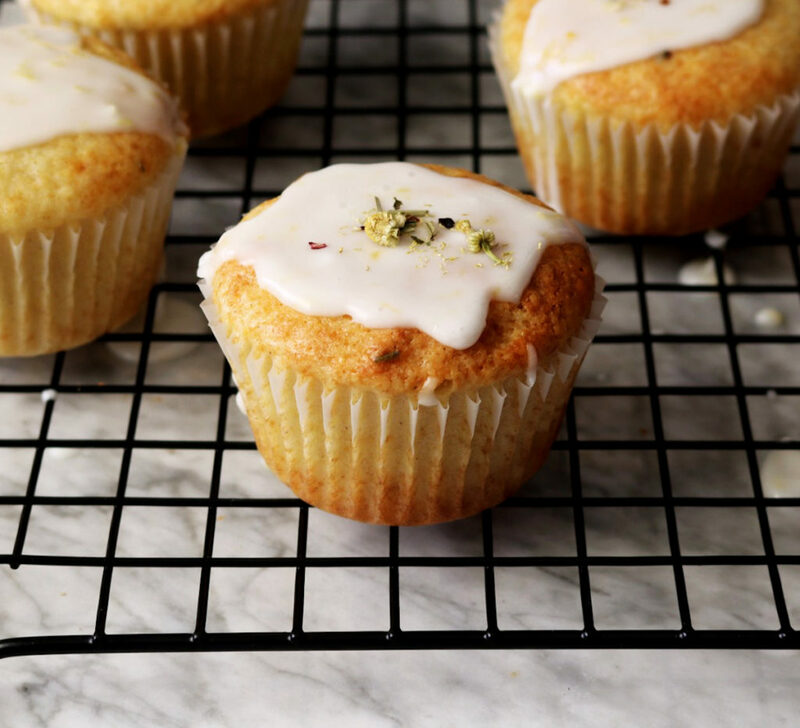 The spices and tea in these little muffins are brilliant and so sweet. I love them. Congratulations on your Bake From Scratch feature come Holiday 2017! That is incredible Rebecca! Yay YOU!!! I can’t wait to see it! These look exactly as you said. Elegant. The things that draw me into these muffins is the way you thought all the flavor elements. 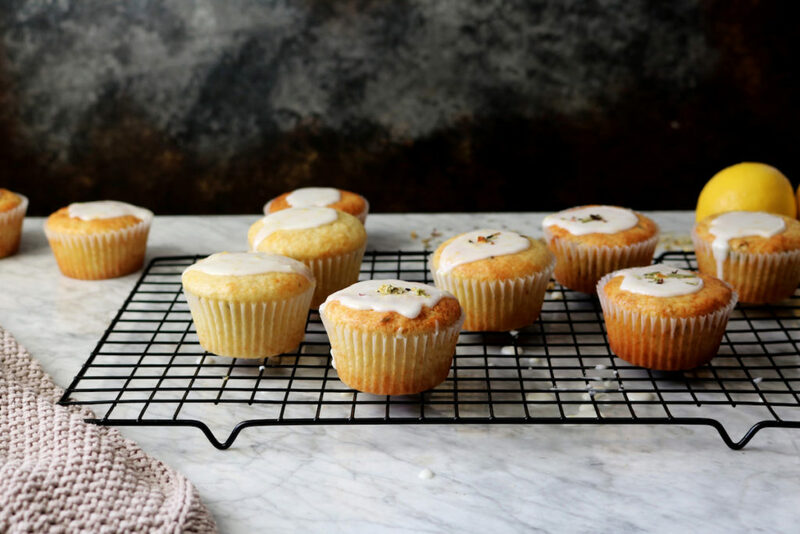 Chamomile, meyer lemon, cardamom…even the sour cream. 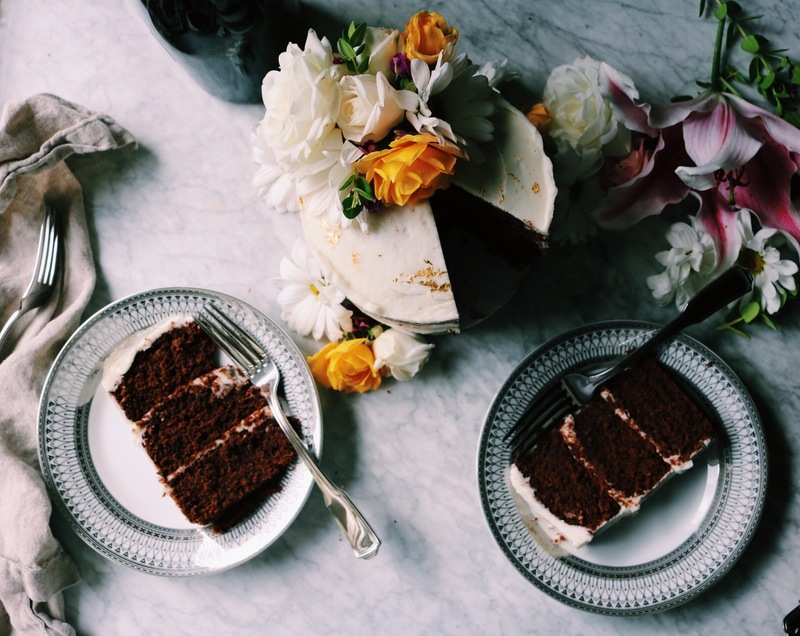 A well thought out recipe that I hope to make next time I host a brunch! so pretty and they sound amazing! I’ve never tried baking with chamomile before and omg I can’t wait to see your recipes in baking from scratch that is huge congrats! I looove the sound of a cupcake cocktail party!! And these lemon chamomile versions are so pretty and elegant. Enjoy your rain – here in Australia we’re burning up! My oh my…. what a profound combination of tastes. Thank you so much ! Loving all the flavors going on in these babies! I’m looking forward to having brunch with you and Mary Ann one of these days! That’s my kinda brunch. I’ll pair these with the lemon-vodka number and call it brunch Rebecca! They sound delish! Fabulous combination! I’ve just read through your blog. Your recipes look fantastic and I plan on trying tons of them. I was so interested to read that there is a Displaced Housewife book buried deep inside of you. Your style of writing is mesmerizing with lots of smiles thrown in “for flavor”. I so hope that book emerges someday soon!! I know that I will read it from cover to cover without putting it down. Here’s to finding your writing between 2 hard covers very soon!!!! Sooooo looking forward to your recipes for the Holiday! Oh my gosh, these look so amazing! I would never have thought to grind up the chamomile with the sugar. Genius!! Definitely making these tonight!